Holiday: Sipadan Island at Sabah, Malaysia. The surface crammed with colorful life, vast schools of fish such as barracuda and jacks, turtles and sharks. These are the possibility of seeing something really exciting such as hammerheads or thresher sharks swimming nearby you. This is what scuba divers from around the world flock to Pulau Sipadan to see. The density and variety of marine creatures in such a small location makes the island special. With the location of diving sites are so near to the shore and a large choice of land-based accommodation makes Sipadan Island really a favorite destination for a diver. 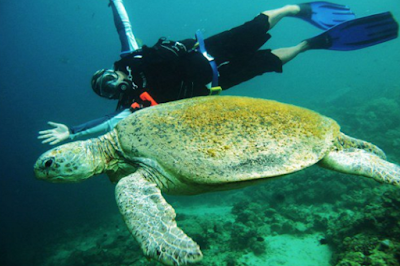 Many resorts offer unlimited diving package and there are also have non-diving activities too. So, this kind of package become the most popular among groups, couple of divers and ordinary tourist. Some of the resort properties are beautiful built by wooden structures over the shallows and others are more like world standard beach resorts. They are all have a common since they are provide a good services that value for your money. The gorgeous underwater views and many amazing diving sites become one of the most bio-diverse regions on earth. 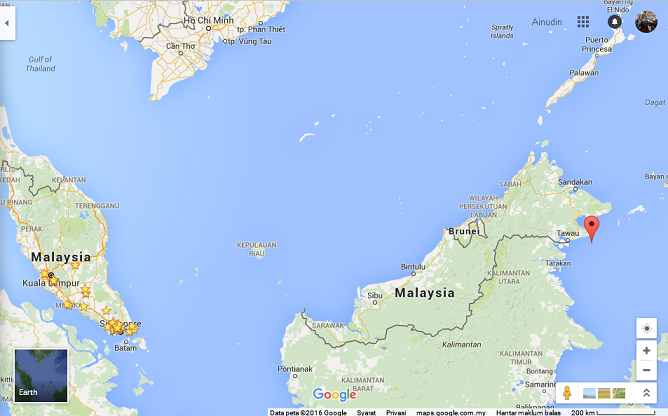 Sipadan Island is located on the North East of Borneo Island in the Malaysia eastern coastal water of Sabah. The Borneo's rain forests and beautiful beaches lie become a factor of exciting Eco-tourist activities. You can see a great view of Mount Kinabalu, the highest mountain in the region and visit the largest ‘orang utan’ sanctuary in the world. Experience the awesome of underwater views with beautiful reef and macro-life organisms. At the end of year 2004, Sipadan Island was closed to tourist stays for conservation purposes. Hence, the resorts had to find new location for their base. Nowadays, in order to have a visit on this tiny island, tourists have to stay on either at the nearby islands (Mabul Island or Kapalai Island) that take about 25 to 30 minutes to reach at Sipadan Island. Both of these islands offer a lot of exciting diving experience with plenty of unique creature to discover. They also can choose for more distant accommodation from the island at the mainland of Sabah, in the port town of Semporna. Since the island of Mabul is consider larger and Pulau Sipadan is out off limits for overnight stays, the resort owners have to construct a much higher standard of accommodation for the visitors. There is now have plenty of accommodation options available such as backpacker rooms and simple, inexpensive beach chalets and expensive/luxurious stilted water bungalows built out over the sea water. 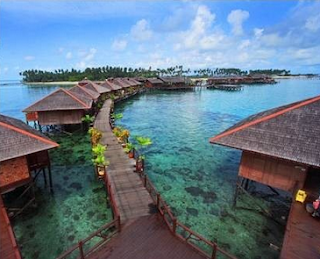 The resorts in Mabul provide large surrounding ares and visitors can explore the green of the island. There are an options that are available if you want to visit to the island by a live aboard boat. This is a gorgeous property, built on stilts over water. It is an exclusive resort and one the best accommodation option. It has a beautiful view in low tide where you can see only a thin strip of sand rises above the water. Mabul Island located at the North of Pulau Sipadan and Kapalai Island is just to the right to North East of Sipadan Island. There is an isolated sandbar beside the island and you can enjoys a serene peace and calming tranquillity from the beautiful view. There are over 40 diving location to explore around this island and all of it have a great underwater views. For a better result, you have to stay for one week to explore some of the best location. However, if you don’t have a time to stay longer, then 4 nights stay should be enough for you to have a great time. The packages normally include full board accommodation with diving (including unlimited unguided shore dives), transportation to the air-port and also provide ‘live boat cruise’ to enter the diving area if you ask for it. Many of the visitors will plan on staying in Kota Kinabalu or Semporna either before or after your Sipadan Island vacation. You can easily find a wide range of accommodation around the city when you get there. Enjoy the islands equatorial climate. The temperature generally varies between 28-34°C during the day and drops about 22°C during the night. This region is generally not very affected by the monsoon seasons which course other places in the South East Asia country. Heavy rains will fall down during the rainy season from mid of December until early March but still can carry out diving activities. For this island point of view, having 80% to 90% humidity in cooling sea breezes will even quite pleasant. The dive season is all year round but the best conditions for diving at this area are thought to be from April to December when the surface conditions are normally calm. Sipadan Island is only about 12 hectares large and is covered by untouched rainforest. It is not possible to stay on the island. There is a national park levy of US$10 per person per day entrance fee. Pulau Sipadan is a protected area to preserve outstanding natural beauty. The diver will be advice to take some precaution and have a responsibly to the nature. There a various choice of activities on Mabul Island depend on which package you choose and different resort have their own kind of package. These including beach volleyball, snorkelling, sea kayaking or you can just relaxing in the pool or Jacuzzi. The island is covered with palm trees and surrounding with fine beaches. There are small quantities of villagers live next door to the resorts and visitors are free to walk around the island and even have a convocation with the locals. Snorkeling around the shallows water is a popular pastime at Kapalai Island but most visitors will consider more on diving. For recovery, they will enjoy sunbathing or just relaxing with a good book. Extraordinary number of exciting views will be available for you when visiting the province of Sabah in Borneo. There are either energy expending or just a great natural interest (or both) will surely satisfied the visitors. Tourists that come to this area are normally environmentally aware. It’s become more interesting than you might see 'foam parties' around the area.